If you’re spending money in Singapore, there is no doubt about it; you should always be using your credit card whenever possible. Even if your credit card has poor rebates, something is still better than nothing. Moreover, you get to delay the payment of your transactions, which means better cashflow for you as your money sits in the bank. However, the answer is not as straightforward when you are making payment overseas. Apart from additional charges, the foreign exchange rates by your card association may differ significantly from the exchange rates you get from money-changers in Singapore. Not many know this, but money-changers in Singapore generally offer one of the best exchange rates available to retail consumers, in the world. Which is why the comparison between card and cash is difficult to make in Singapore's context. 2.5 – 4.0% for most G10 currencies (USD, EUR, JPY, GBP etc.). This assumes you’ll be completing your credit card transaction in foreign currency, and not in your billing currency (SGD) to avoid the extremely poor exchange rates from dynamic currency conversion (DCC). Thus, if your card has rebates that can exceed 2.5 - 5.5%, you might be better off using your card. This could be the case if you optimize your credit card expenditures with specialised cards and if your personal value of a mile is quite high (e.g. you redeem for business/first class), but there are usually certain criteria to meet, such as minimum spending, etc. For most consumers, using cash will still yield you savings. There are usually 3 separate fees when you use your credit card overseas, and we go into greater detail with an example in this article. In short, each time you use your card overseas, you're immediately subjected to fees of 1-3.5% on your transaction amount. Many credit cards also have annual fees, but it is not that difficult to get them waived. This is the fee imposed by the card association (e.g. Visa, MasterCard) for using your credit card overseas. This fee is typically 1.0% on the converted amount. This fee typically ranges from 1.5% to 2.5% on the converted amount, depending on the card association and card. However, some banks may waive it for certain cards. If you pay in foreign currency (e.g. KRW), the foreign exchange rate on your transaction is determined by the card association of your credit card. Since there isn't an explicit numerical fee imposed, a good way to assess this "fee" is to estimate your opportunity costs. In the context of credit cards, your opportunity costs would be using a credit card from another card association (e.g. Visa vs. MasterCard) as card associations give different exchange rates, or against the exchange rate from the money-changer. One common mistake is to compare the exchange rate against the interbank rate. Previously, we compared the exchange rates of various card associations and found that MasterCard generally saves you ~0.5-1.0% in foreign exchange rates across most currencies. What about against the exchange rates of money-changers in Singapore? You'll be surprised to know that money-changers in Singapore typically provide better exchange rates than those from Visa or MasterCard! Let's start with the EUR, a currency many travellers often decide between using card and cash. The EUR is also an excellent example as it is highly liquid, thus efficient, so discrepancies occur infrequently. 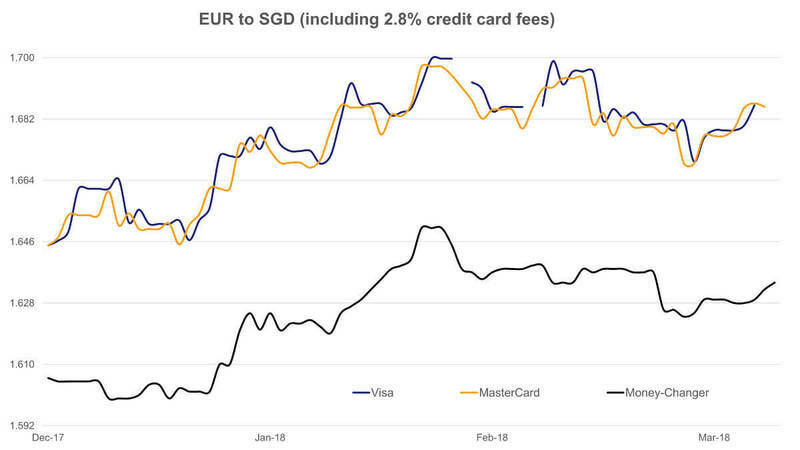 For the last 4 months, exchange rates from competitive money-changers in Singapore were typically 0.3-1.2% better than those from Visa and MasterCard, even before adding credit card fees. Let's now add fees of 2.8%, the most common magnitude of fees among credit cards in Singapore. Based on data from the last 4 months, you can expect to pay about 2.5 - 4.0% more if you used a credit card overseas instead of cash, or S$25 to 40 more for a S$1,000 transaction. However, let's look at another example using an Asian currency, where it is less liquid and larger discrepancies can occur. 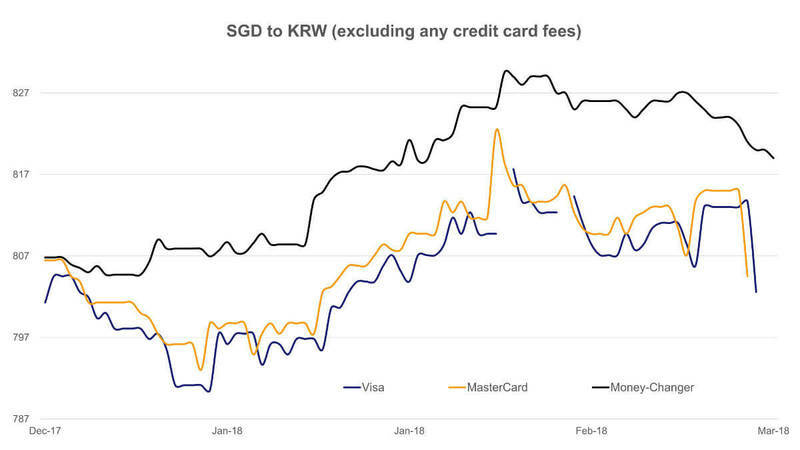 In the same 4-month period, money-changers in Singapore have been selling KRW at exchange rates far better than those from card associations. The exchange rates from money-changers in this period were on average, about 1.5% better than Visa and 1.3% better than MasterCard, even extending to 2.5% on some days. Let us now narrow it down to 1 day. 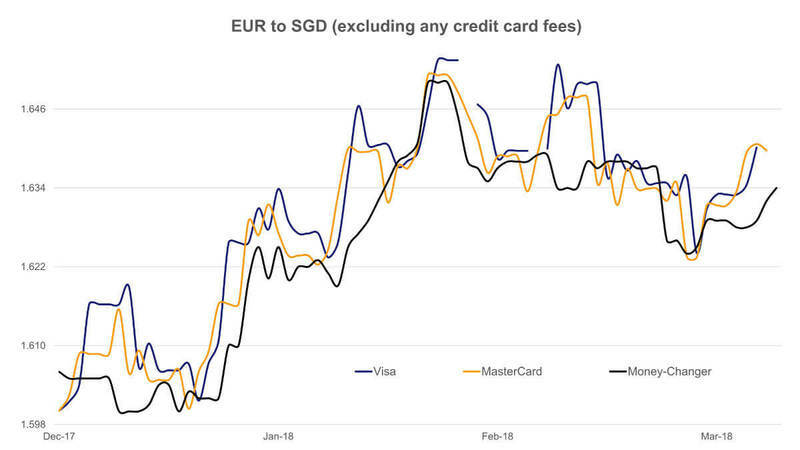 Using the data from 7-Mar-18 as an illustration, the exchange rate from Visa (after fees of 2.8%) against a money-changer in Singapore was about 5.3% worse off (780.64 vs 824.40). What does this mean in terms of SGD? Well, based on a total spending of just S$1,000, you would have paid S$53 more if you used your credit card! When would it make sense to use a credit card overseas? The figures above only take into account credit card fees, and not credit card rebates such as cashback or miles. Despite the credit card fees for overseas usage, there are circumstances when the use of a credit card overseas may make economic sense. For example, if your objective is to redeem a long-haul business/first class ticket for your honeymoon, and you would have been willing to pay the full fare for it anyway, you may find it worthwhile to adopt a specialised card spending strategy to accumulate miles. In another example, there may be promotions by the bank to waive overseas credit card fees for selected cards, or offer siginificant card rebates for a limited time. Apart from the tangible costs/benefits, there are other intangible considerations as well. One main benefit of using cash overseas is certainty; your exchange rate is already locked-in so you know exactly how much you're paying for and exchange rate volatility would not affect you. Also, cash is universally accepted; there is no need to worry about payment modes, minimum spending, or any hidden add-on fees. Depending on the destination, it could make sense to go cash-heavy, such as developing markets in Southeast Asia. Most street vendors do not take cards or require a minimum spending. Even many food stalls in developed markets such as Japan or Korea (and Singapore) still only take cash, and some merchants even give you a discount if you pay in cash. On the other hand, the main concern about using cash overseas is managing the leftover currency after your trip or losing your cash overseas (though we think this is usually mitigated with travel insurance). Another concern is the hassle of getting foreign currency cash in the first place; the time and effort taken to queue at the ATM and/or money-changer. Remember, Thin Margin delivers foreign currencies right to your doorstep at competitive rates! Unless you have very specific spending goals or travel objectives (accumulating miles for business/first class) and an optimised credit card spending strategy, paying in cash typically saves you about 2.5-5.5% on average. If your credit card rebates are at least 2.5 - 5.5%, it might make sense to use that credit card. Whatever the case, we'd still recommend travelling with a combination of cash, credit cards, and ATM cards. Since its an unfamiliar and foreign destination, you''ll never know if the establishment accepts card, or if you run out of cash. Happy travels!